This sweet girl turned 7 last Saturday! I'm still in shock. 7 sounds SO old, right? 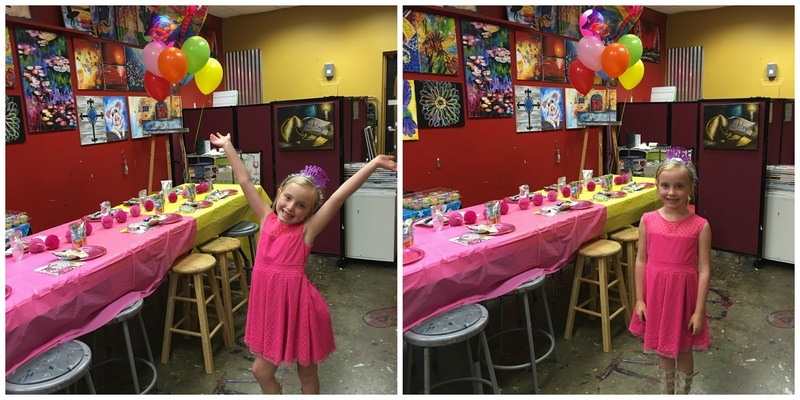 Ebby Lee loves all things art-so we decided a painting party was the perfect way to celebrate her. We invited lots of her girl friends to Painting with a Twist on Sunday afternoon to join us! We arrived a bit early to get the party area decorated just a bit. Tab had a commitment right before the party so all three kids went to help me get set up. I was shocked at how helpful they were! These kids aren't babies anymore. This is how the party got started...a bunch of cute little girls and Nix on stools in front of canvases with some flowers drawn on to make things a little easier. The instructor was teaching them about different brushes. Then he walked them through the painting...one step at a time. When the paintings were finished, we removed all the easels and gave them free reign to paint on the table cloths. We let the paintings dry, while we sang, "Happy Birthday" and enjoyed cupcakes and snacks. This group of girls is FUN! Ebby Lee opened her presents. These girls were all so sweet and "oohed" and "ahhed" over the goodies. We played several rounds of Pictionary and then it was time to head home. Kensington had such a fun time painting at Ebby Lee's birthday! I was super impressed with their work! That party is going to be hard to top mama :). Thanks for including my sweet girl. This is such a great birthday party idea!!! I went to my first paint party Friday night and it was a blast, so I can only imagine how much more fun it would be for 7 year olds! What a CUTE party!! And Ebby Lee looks so grown up in her pink dress! Yes, they had a good time! I know. :(. 7 is old!! What a fun party! And everybody did great on their paintings! I'm VERY impressed!!!!! I love the birthday interview. What a great idea for a party! I especially like the fact that the theme and activity is appealing to both boys and girls. What age do you think is appropriate for this type of party? If the kids are too young I wonder if following instructions and "stirring still" would be an issue. Your thoughts please? Such an adorable party idea! It's always tough finding unique party ideas and love this one for both boys and girls! I love a painting party!! What fun - wish they had these when I was little!! Happy Birthday Ebby Lee! What a fun party!!! They did a great job. I love the interview. So fun. What a fun party!!! I can't believe she is 7!!! Happy birthday to your no longer baby girl!! What a fun party idea! I work with kids and it always blows my mind how creative they are! Happy Happy Birthday Ebby Lee! Some of those paintings are actually really good! I've never done those paint places, but I don't think mine would turn out as well. Happy birthday to your sweet girl! And what a fun idea for a party!! Who doesn't love to paint?! I cannot believe she is 7! It feels like yesterday when I was monogramming all of the aprons for her 5th birthday! I hope she had a fabulous day!! !